I’m sure it goes without saying that the most important beauty tip in the summer time is to protect your skin! (But there I go saying it anyway… ha!) We all need a little reminder now and again to keep our skin protected and safe from the sun with the use of SPF suntan lotion! 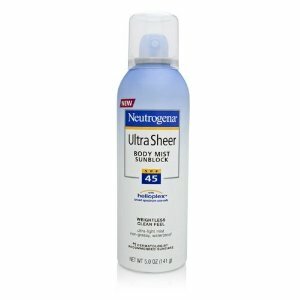 One sunblock product I’m using this summer is Neutrogena Ultra Sheer Sunblock ($7.70 plus $2 shipping at Amazon or at your local drugstore). I love it because it’s so light and it goes on so easily in the spray form. It seems like the higher the number the thicker the sunblock and it’s sometimes tough to get even coverage. This one from Neutrogena is super light and it’s 45! … it provides superior balanced broad-spectrum protection against UVA-aging and UVB-burning rays in an ultra-light, non-greasy finish. This weightless formula applies easily to even hard-to-reach areas. Ultra Sheer Body Mist Sunblock is waterproof, sweatproof and resists running into eyes. This one-touch continuous spray works at any angle. This product features Helioplex, a breadth of stabilized sunscreen technologies that delivers superior protection from the sun. You can check out Neutrogena’s Ultra Sheer Sunblock (SPF 45) on Amazon and keep skin protected in the rays this summer! « Join me Tonight for an #iheartsavvy Summer BBQ chat! Spray on protection is such a salvation with squirmy kids. I’ll add this one to the must-try list.